"Don't Stop to Watch the Wheels"
(1977) "What a Fool Believes"
"What a Fool Believes" is a song written by Michael McDonald and Kenny Loggins. The best-known version was recorded by The Doobie Brothers (with McDonald singing lead vocals) for their 1978 album Minute by Minute. Debuting at number 73 on January 20, 1979, the single reached number one on the Billboard Hot 100 on April 14, 1979 for one week. The song received Grammy Awards in 1980 for both Song of the Year and Record of the Year. The song was one of the few non-disco No. 1 hits on the Billboard Hot 100 during the first eight months of 1979. The lyrics tell a story of a man who is reunited with an old love interest and attempts to rekindle a romantic relationship with her before discovering that one never really existed. It was claimed that Michael Jackson contributed at least one backing track to the original Doobie Brothers recording, but was not credited for having done so. This was later denied by the band. Kenny Loggins released a version of the song (five months prior to The Doobie Brothers) on his 1978 album Nightwatch, and a live version on his 1980 album Kenny Loggins Alive. Loggins' original version switches several of the gender pronouns, so that it is sung largely from the perspective of the woman in the encounter. Warner Brothers also released a 12-inch single disco version by The Doobie Brothers (backed with "Don't Stop to Watch the Wheels"), which peaked at number 40 on Billboard's Disco Action Chart in April 1979. Mixed by disco producer Jim Burgess, at 5:31 the song is considerably longer than the 3:41 versions on the 7-inch single and the Minute by Minute LP. The 12-inch version also has a more pronounced bass-driven drumbeat. "Samba in Your Casa (Cashassa Mix)"
"Say It's Not Too Late"
"What a Fool Believes" is a 12" vinyl EP by Matt Bianco, released in 1991. B2. "Say It's Not Too Late"
1978: Kenny Loggins himself recorded a version of his song from the album Nightwatch. The song was featured in Jeremy Clarkson's Top Gear review of the E60 BMW M5. The Doobie Brothers performed the song as the musical guests on the 27 January 1979 episode of Saturday Night Live. The song was used in the 1982 movie Personal Best. The song is featured in the 2013 video game Grand Theft Auto V on the in-game radio station Los Santos Rock Radio, which was hosted by the song's co-writer Kenny Loggins. The song plays in a scene in The Simpsons episode, "The Monkey Suit". The song, as well as several others by McDonald and Loggins, was featured in Channel 101's comedic mini web series Yacht Rock. ^ "Doobie Brothers should be members of the Rock Hall of Fame | Goldmine Magazine". Goldminemag.com. 2012-02-12. Retrieved 2013-01-10. ^ "Grammy Awards Record of the Year Winners". Top40.about.com. 2012-04-10. Retrieved 2013-01-10. ^ "Michael McDonald on AllMusic". ^ "Michael Jackson Singing Doobie Brothers Minute By Minute _ What a Fool Believes - RARE". YouTube. 2010-01-31. Retrieved 2012-01-08. ^ "Rumor Debunked: Michael Jackson Never Sang on a Doobie Brothers Record". Ultimate Classic Rock. 2014-04-18. Retrieved 2015-06-23. 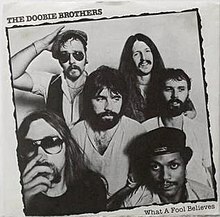 ^ "Classic Tracks: The Doobie Brothers' "What a Fool Believes"". Retrieved 19 June 2018. ^ "Item Display - RPM - Library and Archives Canada". Collectionscanada.gc.ca. 1978-05-12. Retrieved 2018-02-19. ^ "The Irish Charts – Search Results – What a Fool Believes". Irish Singles Chart. Retrieved July 11, 2017. ^ "NZ Top 40 Singles Chart | The Official New Zealand Music Chart". Nztop40.co.nz. 1979-05-20. Retrieved 2016-10-15. ^ "CASH BOX Top 100 Singles – Week ending April 7, 1979". Archived from the original on 5 February 2011. Retrieved 2018-04-03. CS1 maint: BOT: original-url status unknown (link)Cash Box magazine. ^ "Australian Chart Book". Austchartbook.com.au. Archived from the original on 2016-03-05. Retrieved 2016-10-15. ^ "Image : RPM Weekly - Library and Archives Canada". Bac-lac.gc.ca. Retrieved 2016-10-15. ^ "Top Selling Singles of 1979 | The Official New Zealand Music Chart". Nztop40.co.nz. 1979-12-31. Retrieved 2016-10-15. ^ "Top 100 Hits of 1979/Top 100 Songs of 1979". Musicoutfitters.com. Retrieved 2016-10-15. ^ "Year-End Charts: Top 100 Pop Singles,". Cash Box. December 29, 1979. Archived from the original on December 13, 2010. Retrieved 2018-04-03. ^ There is a video of this performance on YouTube titled: "Kenny Loggins What A Fool Believes Live 1992". ^ "What A Fool Believes (12")". Discomusic.com. They comment: Disco from an unlikely artist ... "What A Fool Believes" was remixed by the late Jim Burgess to enhance its dance floor appeal. Another good Doobie Brothers 12 inch release was "Real Love"
^ a b Aretha Franklin has two versions of this song, with the 1999 version being an edited version of the 1980 one. ^ "Album | The Wades | The Feel Good Factor | Hitcity Records | | | 1997". Soulandfunkmusic.com. Retrieved 2016-10-15. Awards for "What a Fool Believes"